“Teething bites!” – All parents (and babies) agree on this. There is no worse feeling in the world than watching your child in discomfort or pain – and being completely helpless. Teething is definitely a milestone I deem as a necessary evil. Your otherwise sweet and wiggly cuddle-bear, turns into a drooling cranky baby from one minute to the next – especially at night, right as you have established an otherwise predictable and mutually comfortable routine. 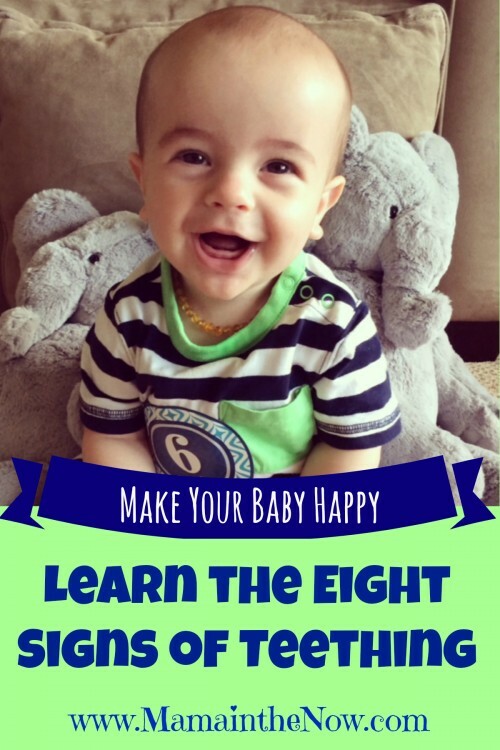 Learn to recognize the eight signs of teething, so you can get your happy baby back in no time. Teething gets blamed for a lot of sleepless nights and trips to the pediatrician – and rightfully so. The process of having those pearly whites erupt through otherwise intact gums IS uncomfortable, especially for little babies who are new to any type of pain. One of the first signs of teething is the increase in saliva, causing your precious little bundle to resemble a rabid dog more than the Gerber baby. Be prepared to add a bib to the daily wardrobe. The drooling may start several weeks, even months before the first tooth appears. With the extra saliva in the mouth and the tooth pushing its way through comes also a slightly runny nose. This runny nose can easily cause a post-nasal drip cough, which simply means that the mucus from the nose drips and pools in the back of the throat. This irritant is cleared with a quick cough, the sound of which is the equivalent of scraping your nails on a chalk board for any parent. The added waterworks in the mouth can surprisingly enough also cause the baby’s stool to become loose. The saliva affects the pH balance in the intestines, which in turn changes the final product. Who knew that all these things were connected in such a delicate balance. And the domino effect doesn’t end here, of course the runny nose is also to blame for the dreaded ear infection. While the baby has not been caught any viruses that could cause an ear infection, the mere presence of extra fluid in the sinuses and inner-ear can lead to an ear infection – or two! There is much debate whether or not teething causes fevers. Many medical professionals say they do not, yet mothers across generations report that their child had an increase in temperature right before or during the time when a tooth erupted. Our pediatrician explained that a low grade temp (100.4 or less) could be a sign of teething. However, anything higher is more than likely bacterial or viral. The reason why kids seem to catch more viruses while they are teething is because they tend to put their hands – or ANY object, in their mouth to relieve the discomfort, thereby exposing themselves to more germs than usual. There are obviously a lot of uncomfortable symptoms associated with teething, which cause crankiness and a disrupted sleep schedule. Once the fun and games of the day-time activities come to an end, your poor little baby is no longer distracted by the outside world, so his teething discomfort seems multiplied causing the sleep problems. With a list that long of symptoms and reasons for tears, (yours as well as baby’s), it is a wonder that we make it through the first year getting any rest at all. Somehow we manage to find a way to calm our babies, relieve their pain and distract them just long enough to get a smile before they doze off. While we are treading through the trenches of parenthood together, I want to share my favorite parenting book with you: “The Danish Way of Parenting “. This is the # 1 book that I give to all my new mommy-friends – and they rave about it! You will love it too! Join my community of empowering and supportive women on Facebook – you are always encouraged to ask questions and help others reaching out for advice. If you are knee-deep in teething, chances are these two posts will be of interest to you! Let’s get through this together. Please leave a comment with your best teething remedies! Oh yeah – the gummy smiles – I can’t get enough of them! Well, she has 2 teeth so far and I’m pretty sure he’s about to pop another because she was super ticked off last night. I couldn’t do anything to calm her down. Phew. At least for us anyway, it’s not everyday. Just a day or two here and there. Thank you for the info! Chirleen – have you ever used an amber teething necklace? They are awesome! I remember when my oldest started teething – I was HORRIFIED that humans hadn’t evolved past having to feel that kind of pain! It still seems so horribly inefficient to have babies go thru that much agony just to get teeth. I am so ready to introduce more foods to our baby girl, who will be one in only 10 days, but still has no teeth yet and doesn’t seem to have signs of teething. I should also mention that she’s 6 weeks preemie. Our oldest daughter had 5 teeth by her first birthday. I just randomly searched teething, so I don’t know if you can give me any answers here, but is there an age to be concerned that you baby hadn’t sprouted teeth yet? Hi Sera, I don’t think it’s cause for alarm, especially when you go by her adjusted age. However, I always err on the side of caution with these things – so perhaps a quick call to your child’s pediatrician or dentist may be in order. If nothing else, it may put your mind at ease. Teething can give both your baby and you many sleepless nights. This article shares the symptoms you must look out for and remedies you should know about.